Hello Friends! O.K. you want to know "WHO is Uncle Jimmy?" Well first of all he is NOT my Uncle...but he is the Uncle of one of my kid's best friends....and he is the brother of another of MY friends...but THAT really doesn't matter. ALL of my friends KNOW I am just about obsessed about stocks, and they all want to tell me about their ideas, many of which are quite good, that they have heard from one source or another to see what I think. Quite frankly, some of them ARE great ideas...but my hands really are tied insofar as MY portfolio is concerned. I mean FIRST, I CANNOT buy any more stocks until I first SELL something at a gain...and second, I have my own methods of picking stocks which I shall not repeat here, but which I discuss ALL OVER this blog. But let's take a look at QMED. And as always, remember that I am an AMATEUR investor so PLEASE do your own investigation of all stocks on this website and CONSULT with your investment advisors before making any of your own decisions to make sure they are appropriate for you! According to Yahoo, QMed, Inc., "...operates in two industry segments: disease management services and medical equipment sales. The majority of the Company's operations consist of the operations of Interactive Heart Management Corp. (IHMC), the Company's wholly owned subsidiary." Yahoo also points out that QMED "...produces, sells and supports a line of ischemic heart monitors and a system that analyzes heart rate variability under the name Monitor One nDx." I do not own any shares of this issue (but Uncle Jimmy IS now a big shareholder). 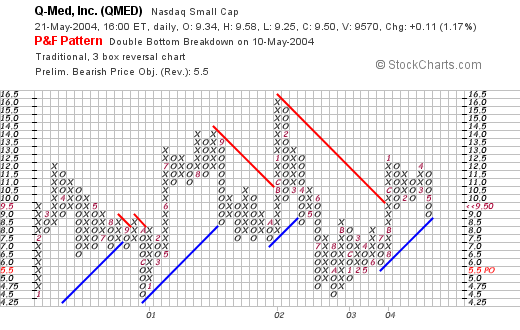 QMED closed at $9.50 on 5/21/04, up $.11 or 1.17% Friday. The next place I like to check for information is Morningstar.com. The easiest for me, an amateur, to understand the financials on a particular company has been the "5-Yr Restated" financials which for QMED is located right HERE. On this page we can see a very nice pattern of revenue growth from $2 million in 1998 to $13.7 million in the trailing twelve months. I DO like that growth! Earnings, however, improved between 1998 and 2002 improving from a loss of $(.26)/share in 1998, finally turning a profit at $.04/share in 2002. However, the company is back losing money, as we discussed above, coming in at a loss of $(.05)/share in the trailing twelve months. What about free cash flow? I like to look at this number Uncle Jimmy, so that I can better get a feel about how the balance sheet is likely to change in the future. Overall, QMED has had Negative cash flow of $(2) million in 2000, $(1) million in 2001, positive cash flow of $2 million in 2002, but turning negative again at $(1) million in the trailing twelve months. Fortunately, their balance sheet looks just fine with $8.6 million in cash and $1.4 million in other current assets, plenty to cover the $2.6 million in current liabilities and $2.3 million in long-term liabilities combined. They ARE indeed quite solvent...but I would like to see that free cash flow improving not deteriorating as it has done in the past 12 months. How about Valuation? For this, I have been using Yahoo finance "Key Statistics". For QMED, this is located right HERE. Looking through the numbers I can see that this is a very SMALL company with a market cap of $140.22 million. The trailing p/e, is, well "n/a" which means the company IS losing money. However, the forward p/e, is a moderate 20.21 (fye 30-Nov-05). The PEG is also unavailable (perhaps there aren't any analysts giving five year forward estimates....not unusual for such a small company), and the price/sales is a very rich 10.64. There are 14.76 million shares outstanding, with 11.10 million of them that float. There are only 226,000 shares out short, but due to the limited trading volume, this comes out to a very LARGE 13.294 trading days even though this represents only 2.04% of the float as of 4/7/04. No cash dividend and no stock splits are reported on Yahoo. What about Technicals? How does the chart look like? I personally have come to appreciate Point & Figure charts which give me a nice feel for the trading "tides". I am an amateur at this however...so make your own assessment! QMED stock certainly shows no signs of getting away from us! The stock has basically been trading sideways since 2000, and is currently selling just above a support level around $9.00. Technically, in my humble opinion, this is a "neutral". So what do I think? I don't know anything about the future prospects of this company. According to Uncle Jimmy, these are "GREAT"....and indeed the company may turn out to be a terrific investment. However, it doesn't on the face of things fit into my selection criteria...that is, I like to see significant revenue growth, along WITH growth in earnings, (QMED doesn't pass), and growing FREE CASH FLOW (QMED doesn't pass). Otherwise I do like the revenue growth, and the company doesn't look over-valued....but I just don't have enough money to buy every stock. But we will revisit QMED...and see how Uncle Jimmy's stock pick works out! Thanks so much for stopping by! And Uncle Jimmy, PLEASE excuse my analysis of this stock....I don't mean to be critical because I don't have that important information about future prospects....it is just that as an amateur investor, I am trying as hard as I can to make coherent investment decisions based on my own criteria....and QMED just doesn't fit in today. But you are a GREAT GUY and I really enjoyed visiting with you and REMEMBER to take the kids out for Kentucky Fried Chicken like you PROMISED THEM! Have a great week investing everyone! Hello Friends! We made it through another week and now we have the weekend before us. Thank goodness for that. Last week I started a new review process...if you have any comments or questions about this or anything else on this BLOG, please email me at bobsadviceforstocks@lycos.com and I will try to respond. As always, please remember that I am an AMATEUR investor and that you should do your own investigation on ALL stocks discussed on this blog and consult with your PROFESSIONAL investment advisor to make sure they are timely, appropriate, and even profitable investment ideas for you! The first stock "picked" that week was selected for Bob's Advice on May 19, 2003, at the price of $15.77. BDY closed on 5/21/04 at $22.52 for a gain of $6.75 or 42.8%. On April 29, 2004, BDY announced 1st quarter 2004 results. For the quarter ended March 31, 2004, net sales totaled $25.1 million, a 68% increase over the $14.9 million reported the prior year. Net income for the first quarter was $6.2 million, up $3.3 million or 117% compared to prior year figures. This company is STILL doing great! Also on May 19, 2003, I listed Genentech (DNA) on Stock Picks at a price of $53.04, however, DNA split 2:1 on 5/13/04, so our adjusted pick price was actually $26.52. Genentech closed on 5/21/04 at $59.61 for a gain of $33.09 or 124.8%. On April 7, 2004, DNA announced 1st quarter 2004 results. Product sales were $763.7 million in the first quarter, up 28% over the prior year. Operating revenues increased 30% to $975.1 million from $749.7 million in the prior year (clearly there is a difference between operating revenues and product sales!). GAAP earnings per share came in at $.33/share fully diluted vs. $.29/share GAAP earnings the prior year. It does make me a little nervous with all of the "pro forma" and GAAP and non-GAAP numbers on this balance sheet as I am NOT an accountant and do not like seeing all sorts of footnotes...but DNA has done great in the market...and the market liked these numbers! Home Depot was selected for Stock Picks on 5/20/03 at a price of $31.10. HD closed at $34.47 on 5/21/04 for a gain of $3.37 or 10.8%. How is Home Depot doing now? On May 18, 2004, HD announced 1st quarter 2004 results. Net sales were up 16% to $17.55 billion (topping estimates of $17.12 billion). First quarter net income came in at $1.1 billion or $.49/share compared with $907 million or $.39/share last year. Same store sales (those open at least a year) gained 7.7%, "...the highest first period growth in five years." These were great results! On May 21, 2003, I selected Synovis Life Technology (SYNO) for Stock Picks at a price of $14.39. SYNO closed on 5/21/04 at $9.54 for a loss of $(4.85) or (33.7)%. Not EVERY stock on this blog makes money! $1.9 million the prior year. Net income came in at $483,000, or $.04/diluted share, vs. $1.2 million or $.12/diluted share the prior year. In addition, SYNO also CUT GUIDANCE for the upcoming year. This is NOT very good results, and this would not be the kind of stock I would be looking for to post on this website! Enzo Biochem (ENZ) was posted on Bob's Advice on 5/22/03 at a price of $20.40. ENZ closed on 5/21/04 at $12.76 for a loss of $(7.64) or (37.5)%. On March 16, 2004, ENZ reported 2nd quarter 2004 results. Operating revenue for the second quarter of 2004 came in at $11.0 million, down from $13.1 million the prior year. Gross profit ammounted to $8.1 million, down from $10.4 million last year. Net loss for this quarter came in at $(1.5) million or $(.05)/diluted share compared to net profit the prior year of $1.4 million or $.05/share. These are not what I would call great results! Over and over we can see for ourselves the relationship between good revenue and earnings news and good price movement. Bad news almost inevitably results in poor price performance! I posted Dicks Sporting Goods (DKS) on Stock Picks at $29.75/share on 5/22/03. DKS split 2:1 in 4/04 making our effective stock pick price $14.88. DKS closed on 5/21/04 at $25.35 for a gain of $10.47 or 70.4%. On May 18, 2004, DKS reported 1st quarter 2004 results. Total sales for the quarter increased 20% to $364.2 million, with comparable store sales up by 4.6%. Net income zoomed 64% to $10.9 million and earnings per share increased 50% to $.21/diluted share from net income of $6.7 million or $.14/diluted share for the quarter ended May 3, 2003. The street was not so excited about DKS' statement on the upcoming quarter when they forecast same store sales growth in the range of 2-3%. We can see the importance of same store sales growth numbers in both the stock price performance and the actual financial performance of any retail company! On May 22, 2003, I posted New Century Financial (NCEN) on Stock Picks at a price of $47.02. NCEN had a 3:2 split on 7/14/03 making our effective selection price $31.35. NCEN closed on 5/21/04 at $41.35 for a gain of $10.00 or 31.9%. On 4/22/04, NCEN announced 1st quarter 2004 results: total revenues came in at $361 million, up from $181 millionlast year. Diluted earnings per share came in at $2.03 up from $1.23/share last year. These are great results for the quarter ended 3/31/04. I selected NVR (NVR) for Stock Picks Bob's Advice on 5/23/03 at a price of $394.86. NVR closed on 5/21/04 at $434.50 for a gain of $39.64 or 10%. On April 16, 2004, NVR announced 1st quarter 2004 results. Total revenues increased 18% to $879 million compared to $744 million in 2003 same quarter. Net income came in at $100.6 million compared to $87.8 million the prior year, and diluted earnings per share increased 25% from $10.10 last year to $12.58 this latest quarter. These were great results. o.k. HANG IN THERE I AM AT THE LAST ONE! Red Robin Gourmet Burgers (RRGB) was selected for Stock Picks Bob's Advice on 5/23/03 at a price of $17.00. RRGB closed on 5/21/04 at $27.29 for a gain of $10.29 or 60.5%. So is RRGB still selling burgers? Well on 5/20/04 Red Robin announced 1st quarter results. For the quarter ended 4/18/04, total company revenues increased 25.7% to $116.7 million, company-owned comparable store sales increased 8.4%, income from operations jumped 40.8% to $8.6 million, and diluted earnings per share increased 36.8% to $.32. These are very nice results in my opinion. In SUMMARY, of these nine stocks selected the week of May 19, 2003, a year later seven were sporting gains ranging from 10.0% (NVR) to 124.8% (DNA); two stocks were losing money: SYNO (33.7)%, and ENZ (37.5)%. The average performance for these nine issues was a gain of 31.1%. Now that isn't too bad a performance considering even the week three months of this year! Hello Friends! Thanks as always for taking the time to stop by and read my blog. I mean if you guys didn't come and visit, there would be NO reason for me to be writing. Remember, though, as polished as I try to make this blog, that I am an AMATEUR investor, that you need to do your own research on all investments discussed on this blog prior to making any investment decisions, and that you need to discuss these decisions with a PROFESSIONAL investment advisor who can let you know whether they are appropriate, timely, and even likely to be profitable for you! 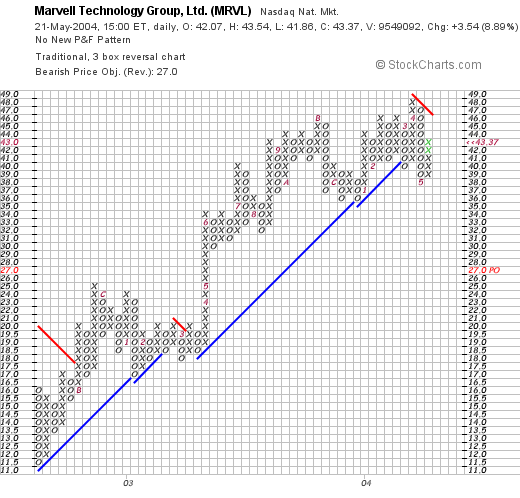 I came across Marvell Technology Group (MRVL) today on the list of greatest gainers. As I write, MRVL is trading at $42.99, up $3.16 on the day or 7.93%. According to Yahoo, Marvell "...is a global semiconductor provider of high-performance analog, mixed signal and digital signal processing integrated circuits." Clearly this is NOT one of those Peter Lynch kind of investments that your daughter happened to bring home from the mall! But their numbers look great to me, so let's take a closer look! Yesterday, Marvell reported 1st quarter 2005 results. Net revenue came in at $269.6 million, a 60% increase over the net revenue of $168.3 million in the same quarter in 2004...and an 11% sequential increase from the net revenue of $243.3 million, the prior quarter. Net income (GAAP), came in at $14.5 million, or $.10/diluted share vs. $4.4 million, or $.03/dilued share the prior year. These are nice numbers! If we look at Morningstar "5-Yr Restated" financials, we can see that revenue has grown explosively from $21.3 million in 1999, to $727.3 million in the trailing twelve months. It really is a pretty series of bar graphs! Earnings have improved from losses of $(3.55) in 2001, $(3.63) in 2002, to a profit this past year. Free cash flow has also improved from $0 in 2001, to $25 million in 2002, $12 million in 2003, and $92 million in the trailing twelve months. The balance sheet as presented by Morningstar.com is gorgeous (!) with $400.3 million in cash, more than twice the amount of Current Liabilities ($164.8 million) and Long-Term Liabilities ($55.2 million) combined. In addition, MRVL has another $213.8 million of OTHER current assets. This company is quite solvent in my humble opinion. What about "valuation"? Looking at "Key Statistics" on Marvell, the company has a pricey trailing p/e of 133.46...due to the fact that they are JUST turning profitable....yet the growth is so fast that the forward p/e (fye 31-Jan-06) is modest at 24.99. Thus the PEG is downright cheap at 0.77. (anything under 1.0 on a PEG is cheap imho.) The price/sales is rich at 6.42 however. There are 132.23 million shares outstanding per Yahoo, with 62.40 million of them that float. Of these, 8.89 million are out short as of 4/7/04, representing 2.982 trading days or 14.25% of the float. This is DOUBLE the short interest of 4.40 Million from the prior month. These shares NEED TO BE COVERED....and the price rise on good news might just be a bit of a "short squeeze" in here. No cash dividend is paid, and Yahoo does not report any stock splits. we can see what looks like a possible breakdown in price recently through a support level at about $42 in late April, 2004. However, the stock is moving higher at this point, and I do not see the long-term trend interrupted. However, please review the chart yourself as I am certainly a NOVICE technician! What do I think? I like this stock. The revenue growth is fabulous. The earnings are growing nicely. The company is generating lots of free cash on an already beautiful balance sheet. The trailing p/e IS a bit rich (over 100 lol), but with a PEG under 1.0, the anticipated growth in a company that is just turning profitable, makes the p/e tolerable in my opinion. Technically, it doesn't look too bad. I just don't have any cash to invest...am down to 19 positions...will need to update that trading portfolio soon....but am waiting for one of my 19 to hit a sell point on GOOD news....but that is an OLD story....Meanwhile, I am sitting on my hands! Hello Friends! Thank you so much for stopping by. Each day I scan the lists of advancing stocks looking for something I can share with YOU! And when you come visit, and my hit-counter goes up a notch, I am grateful for your interest! As always, please remember that I am an amateur investor so please always do your own investigation of all stocks on this website before making any purchase or sell decisions, and consult with your professional investment advisor. 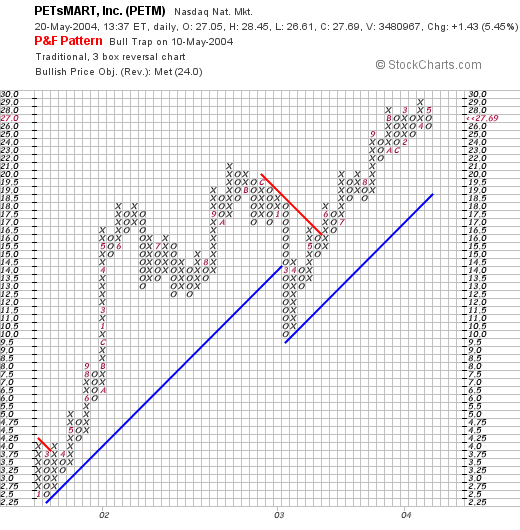 I came across Petsmart (PETM) on the greatest percentage gainers in a relatively flat market today. I do NOT own any shares of this nor do I have any leveraged positions. PETM had a nice day today closing at $28.40, up $2.14 or 8.15% on the day. According to Yahoo, Petsmart, or PETsMART as it is sometimes written, "...is a provider of products, services and solutions for the lifetime needs of pets in North America. It operates 643 retail stores in North America." And guess what? EARNINGS RESULTS drove the price higher today. I strongly believe that good earnings and revenue growth drive a stock higher in price over both the short and the long-term. They reported 1st quarter results today for the quarter ended May 2, 2004. Sales were up 14.5% to $796.3 million and earnings rose to $35.8 million or $.24/share from $24.6 million or $.17/share a year earlier. These are nice results in my opinion. If we look at the Morningst.com "5-Yr Restated" financials, we can see that revenue growth has been steady since 1999 when it was $2.1 billion, and has grown to $2.9 billion in the trailing twelve months. Earnings have been a bit erratic dropping to a loss of $(.28)/share in 2001, but have improved steadily since then to a level of $.73/share in the trailing twelve months. Free cash flow has also been steadily positive (is that good English??? ), with $66 million reported in 2001, $85 million in 2002, $59 million in 2003 and $40 million in the trailing twelve months. The balance sheet looks great with $234.3 million in cash and $428.1 million in other current assets, more than enough to pay off BOTH the current liabilities of $317.0 million AND the long-term liabilities of $202.6 million combined. Looking at "Key Statistics" on Yahoo Finance, we can see that PETM is a large cap stock with a market cap of $4.10 billion. The trailing p/e isn't bad at 29.99, and the forward p/e (fye 1-Feb-06) is even nicer at 20.14. The stock is reasonably priced, in my opinion, with a PEG of 0.93, and a price/sales of only 1.27. Yahoo reports that there are 144.36 million shares outstanding with 142.40 million of them that float. Currently there is a significant short interest, as of 4/7/04 per Yahoo, of 6.12 million shares, almost a million more shares out short than the prior month. This represents 5.393 trading days or 4.30% of the float. The current stock rise may well represent a bit of a short "squeeze". The stock DOES pay a small dividend of $.12/share yielding 0.46%. No stock split is reported on Yahoo. we can see that the stock has actually been heading higher faily steadily since late 2001, and broke through a support level in March 2003, only to advance again to a higher level in a fairly uninterrupted fashion. I do not think my description is highly un-sophisticated....but you can look at the chart and see for yourself! So what do I think? I like PETM a lot. Of course I don't have any money to buy any shares (LOL)...but the earnings results are nice, the valuation is excellent with a p/e under 30...but a PEG under 1.0! The balance sheet is superb, and the company continues to generate generous amounts of free cash. If you have any questions, comments, or words of encouragement, please feel free to email me at bobsadviceforstocks@lycos.com Please also spend time with the little calendar in the upper left part of the page and look through the pages and pages of past posts....as the old Ronald Reagan joke goes, "There must be a pony in there somewhere!" Have a great Thursday evening everyone! Thanks so much for stopping by! The trading portfolio is doing a bit of a recovery today as the market improves....two days does not make a bull market...but maybe after a third? As always, please remember to consult with your investment advisors and do your own due diligence on all stocks discussed on this website! Scanning through the lists of greatest gainers today, I came across Advanced Neuromodulation Systems (ANSI). I do not own any shares of this stock nor do I have any options or leveraged positions. ANSI is trading, as I write, at $33.03, up $3.56 on the day or 12.08%. According to Yahoo.com, ANSI "...designs, develops, manufactures and market advanced implantable neuromodulation devices that improve the quality of life for people suffering from chronic pain." This morning, ANSI announced 1st quarter 2004 results. For the three months ended March 31, 2004, revenue increased 35% to $26.6 million from $19.6 million the prior year. Net income for the quarter increased 51% to $4.0 million or $.19/diluted share from $2.6 million or $.13/diluted share last year. Bottom line, this company had a terrific quarter and the stock price has responded accordingly! If we look at a "5-Yr Restated" financials from Morningstar.com, we can see a fairly impressive and steady growth in revenue from $23.4 million in 1998 to $83.6 million in the trailing twelve months. The company, extrapolating the just reported revenue figures, is operating at a $100 million/year rate for 2004. Earnings dipped from $.46/share in 1998 to $.06/share in 2000, but have increased steadily and dramatically since then. Free cash flow which was negative at $(1) million in 2000, has turned positive at $1 million for the trailing twelve months. The balance sheet is gorgeous! With $96.6 million in cash alone enough to cover the current liabilities of $7.7 million AND the long-term liabilities of $5.4 million, about EIGHT TIMES OVER! And they also have $39.8 million in OTHER current assets. This part of the equation is a "no-brainer". If we look at "Key Statistics" from Yahoo, we can see that the Market Cap is a small $659.97 million with a trailing p/e of 47.35 which sounds rich, but the company is growing so fast that the forward p/e (fye 31-Dec-05) is only 27.97. Thus, the PEG is at 0.91...making valuation less of a problem. Price/sales is also a bit rich at 6.01. Yahoo reports 20 million shares outstanding with 18.60 million of them that float. There are a good number of shares out short, with 2.25 million reported as of 4/7/04, representing 12.11% of the float or 3.798 trading days. This is at a level, that with good news, as we got today, we may see a bit of a panic, or squeeze, as the short-sellers scramble to cover their shorts. Yahoo does not report any cash dividend and the last stock split reported was a 3:2 split in July, 2003.
we can see that this stock was trading quite nice between August, 2002 and February, 2004, and actually has broken down from its recent support level of $40. Technically, imho, would like to see the stock break through its resistance level at around $41 before reporting its "technical good health"....but then again, I am but an amateur in reading these charts so you may have a different take in this matter! What do I think. Well, if I didn't have some trading rules REQUIRING ME TO SIT ON MY HANDS, I would probably be picking up some of these shares. However, I still have lots of margin and my trading rules demand that I sell some stock at a targeted gain before adding another position. Oh well, but that is old news to you of course! Hello Friends! At least we got a little reprieve from that downward spiral we have ben in for the last few weeks. The Dow finished at 9,968.51, up 61.60 on the day and the NASDAQ finished at 1,897.82, up 21.16 on the day. As always, please remember that I am an amateur investor so you always need to do your own investigation of all stocks discussed on this website and please consult with your own investment advisors! I came across Staples (SPLS) as I was scanning the lists of greatest percentage gainers today. SPLS closed at $26.39, up $1.97 on the day or 8.07%. According to Yahoo, Staples is "...an office supplies retailer that sells its products through a superstore concept." This morning, SPLS reported 1st quarter results. For the quarter ended May 1, 2004, net income rose to $125.7 million or $.25/share, up from $24.8 million or $.05/share a year earlier. Total sales for the chain were up 12% to $3.45 billion, and North American same store sales (open at least a year) were up 5%. Most importantly, the $.25/share exceeded analysts expectations of $.22 by $.03. SPLS announced that it expected earnings of $.22/share for the second quarter which is an increase over analysts expectations of $.16/share for that quarter. These results are just what the stock needed...and the price result subsequently developed as the day progressed! Morningstar is down as I write, but the "5-Yr Restated" financials look just fine with growing revenue, solid free cash flow, and a nice balance sheet. If we look at "Key Statistics" on Yahoo.com, we can see that the trailing p/e is moderate at 26.93, a forward p/e (fye 31-Jan-06) is even nicer at 16.92. The PEG is thus reasonable at 0.93, and the Price/sales is also under 1.0 at 0.93. There are 499 million shares outstanding with 495 million of them that float. Currently, there are 4.99 million shares out short, which isn't really that bad with 1.01% of the float out short representing only 1.038 trading days. 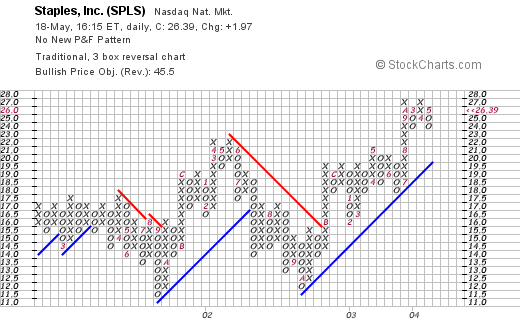 If we look at the point & figure chart on SPLS we can see that the stock was trading sideways through 2001 and 2002. In Septemeber, 2002, SPLS broke through a resistance level at around $15 and has traded higher since. Hello Friends! Thanks again for stopping by. The market is continuing to act weak and I have hit a couple of stops on two of my recent purchases: Claire's (CLE), and Meridian Bioscience (VIVO). I like both of these but out they went this morning. I sold 300 shares of CLE this morning at $18.28. I purchased these shares on 2/5/04 at a cost basis of $20.17/share. Thus, I had a loss of $(1.89) or (9.4)%. Later this morning, my shares of Meridian Bioscience (VIVO) were sold, with 400 shares being sold at $10.46. These shares were JUST purchased on 4/22/04 for a cost basis of $11.46/share for a loss of $(1.00)/share or (8.7)%. I loved this stock too, I mean it EVEN pays a dividend! But that 8% rule is one thing I am trying HARD to follow. Hopefully, I can sit on my hands before rebuying any shares of another company! Hello Friends! Thanks so much for stopping by! The weekend is the time for me to review my past selections: The "good, bad, and the ugly." (apologies to Clint Eastwood.) As always, please remember that I am an amateur investor and that you should do your own investigation on all of the stocks discussed here and consult with your investment advisors to make sure investments are suitable and timely for your investment needs! The first stock picked on Stock Picks Bobs Advice (whatever am I going to do about THAT missing apostrophe...oh well...) was St Jude Medical (STJ) which was selected for the blog on 5/12/03 at $55.30. STJ closed on 5/14/04 at a price of $74.74 for a gain of $19.44 or 35.2%. What about recent news? On April 21, 2004, STJ announced 1st quarter 2004 results. Net sales were up 24% (about 6% of that was due to currency exchange effects), to $549 million from $441 million the prior year. Earnings for the first quarter were $96 million, a $16 million or 20% increase over net earnings of $80 million. Per diluted share this came out to $.52 in 2004 a 21% increase over the $.43/diluted share in the first quarter of 2003 ended March 31st. On May 14, 2003, J2 Global Communications (JCOM) was selected for the blog at $32.60. They had a 2:1 split so the adjusted pick price was $16.30. JCOM closed at $22.96 on 5/14/04 for a gain of $6.66 or 40.9%. On April 19, 2004, JCOM reported 1st quarter results. Revenues for the quarter ended March 31, 2004, increased 51% to $22.9 million from $15.2 million in the same quarter the prior year. GAAP Net Earnings per diluted share increased 25% to $.25/share from $.20/share the prior year. JCOM appears to be doing just fine! HealthExtras was selected for Bobs Advice on 5/14/03 at a price of $5.70/share. HLEX closed on 5/14/04 at $14.00/share for a great gain of $8.30 or 146%. HealthExtras reported 1st quarter 2004 results on April 28, 2004. Revenues totaled $110.5 million, a 21% increase over last year's revenues of $91.7 million. Net income came in at $3.4 million or $.10/share, a 79% increase over first quarter 2003 earnings of $1.9 million or $.06/share. HLEX appears to be right on track! 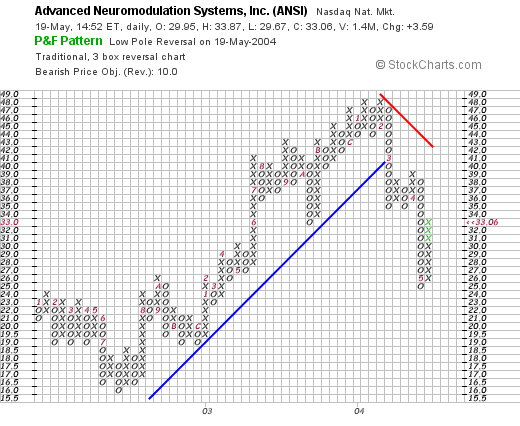 AMN Healthcare Services (AHS) was posted on Bob's Advice on 5/15/03 at a price of $10.05. AHS closed at $15.21 for a gain of $5.16 or 51.3% during this period. On April 28, 2004, AHS reported 1st quarter 2004 results. Revenue was $161.3 million, down from $199.8 million for the first quarter of 2003. Net income came in at $4.6 million or $.15/share compared to $12.4 million or $.29/share the prior year. However, these results were slightly better than the PRIOR quarter...so the market did not punish the stock price much at all. My judgement on this one is out. Certainly this stock does not fulfill the requirements of this blog to be picked as a possible purchase, but then again, we have a nice gain on the pick (although I do NOT own any shares)...so if I owned it, I would be sitting tight...letting the market price dictate my actions. On May 16, 2003, I picked Agree Realty (ADC) for the blog at a price of $23.41. ADC closed 5/14/04 at $23.05 for a loss of $(.36) or (1.5)%. On April 23, 2004, ADC reported 1st quarter 2004 results. Since this is a REIT, the results are not typical for some of our other companies: funds "from operations" increased 17.4% to $4.3 million compared to $3.6 million the prior year. Diluted funds from operation were $.60/share compared to $.71/share the prior year. Net income, however, increased 29% to $2.9 million or $.45/share compared with net income the prior year of $2.2 million or $.50/share. Clearly there are more shares out this year diluting some of the income. Overall this is a satisfactory if not exciting result imho. So how did we do that first week in May when I set out to start picking stocks for this blog? Of the five stocks picked a year ago, I recorded gains (Of these stocks I currently only own some shares of STJ in my trading account, and I believe I have some shares of HLEX in a managed account that I do not decided purchases or sales) ranging from +35.2% to +146%, with a single loss of (1.5)%, for an average performance of a gain of 54.4%. This was a GREAT week and a GREAT start for this blog! Hello Friends! Thanks for stopping by! As always, please remember to do your own investigation of stocks and consult with your financial advisors before acting on any information discussed on this website. The market is acting anemic but at least it is not plummeting as I write. In fact, in my trading account, I have not hit any sell points. In some ways, this has been a problem as I have had to "pony-up" some cash to deal with the high margin level. 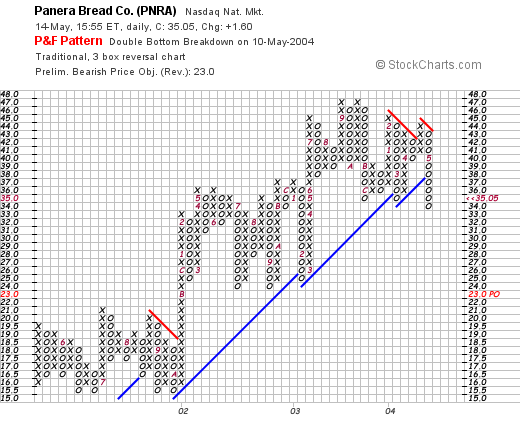 Today Panera Bread (PNRA) hit the list of top gainers. As I write, PNRA is trading at $35.63, up $2.18 or 6.52% on the day. According to Yahoo, PNRA "...operates a retail bakery-cafe business and franchising business under the concept names Panera Bread Company and Saint Louis Bread Company." On May 13, 2004, Panera reported 1st quarter 2004 results. Company revenue jumped 29% to $130 million from $101 million in 2003. (Franchise revenue jumped 25% from $199 million to $248 million in the same period). Earnings per diluted share increased 24% to $.31/share for the 16 weeks ended April 17, 2004. On a comparable store basis, sales jumped 1.8% during the period. An interesting note on this company, is the fact that it was formed in 1981 under the name Au Bon Pain Co. In 1993, Au Bon Pain purchased the Panera Bread assets. By 1999, the Au Bon Pain division was sold and the name of the company was switched to Panera Bread. Reviewing Morningstar.com "5-Yr Restated" financials, we can see that the revenue was dropping through 2000 from $249.7 million in 1998 to a bottom of $151.4 million in 2000. At this time, the company was transitioning to the Panera Bread Concept, and revenues have grown steadily since then to the current $334.2 million in trailing 12 month revenue. Earnings, which also bottomed at $(.03)/share in 1999, have improved steadily each year since with $.91 reported in the trailing twelve months. Free cash flow has improved from a break-even $0 in 2000, to $29 million in the trailing twelve months. Looking at the balance sheet on the same Morningstar site, we can see that the company has $45.1 million in cash and $34.0 million in other current assets, enough to pay off BOTH the $34.7 million in current liabilities and the $6.7 million in long-term liabilities. Looking at "Key Statistics" from Yahoo, we can see that the Market Cap is a mid cap $1.06 Billlion, the trailing p/e is 32.86 with a forward p/e of 21.44 (fye 27-Dec-05). The PEG on this stock is very nice at 0.87, with a price/sales of 2.60. Yahoo reports 30.11 million shares outstanding with 23.10 million of them that float. There ARE 7.09 million shares out short which is a BIG short level, representing 8.96 trading days or 30.68% of the float as of 4/7/04. The move upwards in the stock price today MIGHT be due to all of this pent up demand for shares by the shorts! No cash dividend is paid, and the last stock split reported by Yahoo was in January, 2002. We can see that the stock HAS actually demonstrated some weakness lately...having broken through the support level at $38. What do I think? First of all, I do NOT own any shares nor do I have any options or leveraged positions. That being said, PNRA actually looks pretty interesting to me. The valuation is nice with a PEG under 1.0. I would rather have a bit stronger level of same store sales...better than the 1.8% reported. However, with all of the short interest chasing shares, we may just see a nice price rise! Thanks so much for stopping by! If you have any questions, comments, or words of encouragement, please feel free to email me at bobsadviceforstocks@lycos.com. O.K. so I am a year old. That doesn't sound like I should be old enough to drive a car! Anyhow, I am FINALLY getting around to reading OTHER PEOPLE's blogs. Alright I have been trying to get other people to read MY blog...but I have resigned myself to a level or readership somewhere under stellar. So I am starting to realize there are a lot of AWESOME blogs out there. Came across sugarmama as a link from a link or something or other. By the time I am into three links back....well I can never remember EXACTLY where I started. Anyway, I am going to try to expand upon my endless stock comments and start to talk to you about more than stocks....well a little anyhow! Have a great evening everyone, and come back and visit often now!